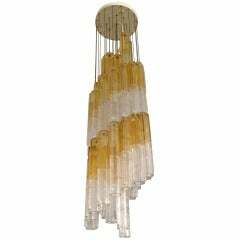 This extraordinary Venetian chandelier is proveniente from a famous Hotel de la Ville Roma. Stamped Venini e C Vetri soffiati muranesi, 1921-1925. This extraordinary Venetian chandelier is proveniente from a famous Roman Hotel de la Ville. Stamped Venini e C Vetri soffiati muranesi 1921-1925. 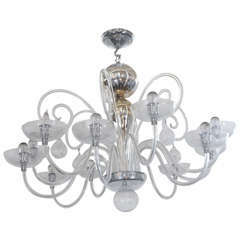 Chandelier in Murano handblown glass by Venini It consists of 200 tubes illuminated by 34 light bulbs with small attack. An incredible source of light to illuminate a large area. 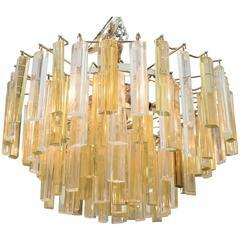 A wonderful cascading handblown amber and clear glass tube chandelier by the Murano firm, Venini. Signed. Venini blown glass and metal 12-arm chandelier.